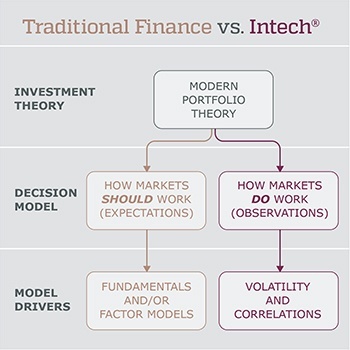 We adhere to an investment paradigm that's different than traditional financial economics embraced by most asset managers – both fundamental and quantitative. Our work is grounded in Stochastic Portfolio Theory formulated by our founder, the eminent mathematician Dr. E. Robert Fernholz. Having once worked along-side Harry Markowitz , the father of Modern Portfolio Theory, Dr. Fernholz introduced this complementary mathematical theory that tells us how it’s possible to outperform a benchmark. Construct a portfolio more efficient than the benchmark by reweighting its constituents to the optimal proportions for a given risk-return objective. Equity volatility is an observable and accessible alpha source whether markets are up or down. Long-term stability in the distribution of capital allows persistent access to this opportunity. Harnessing volatility for risk-adjusted results requires advanced mathematics and programmatic trading systems. This has been the foundation of our work for over 30 years.